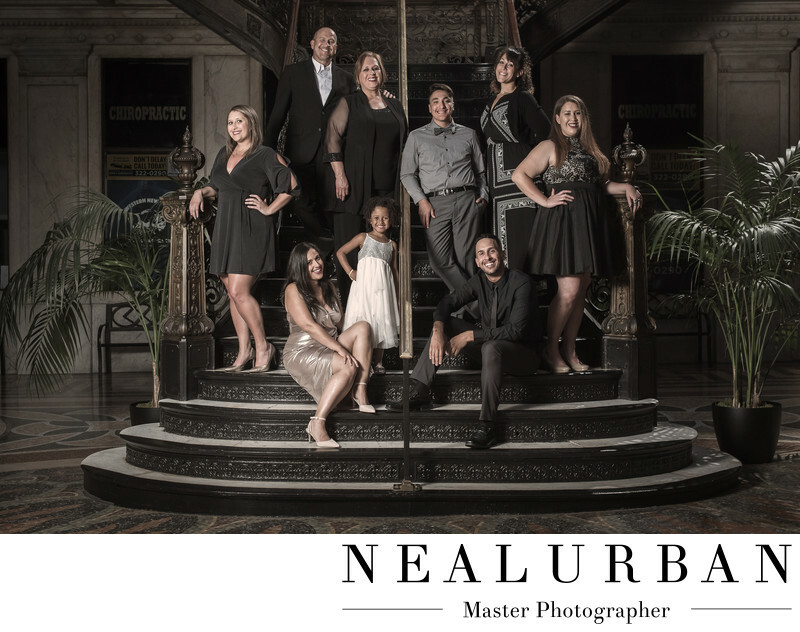 Andy, who currently resides in LA, contacted us for a family portrait session. He was going to be visiting his family in Buffalo and wanted to do a high end photo session! We loved his vision. We sent him some locations that we thought he would like. He ended up going with the Ellicott Square Building in downtown Buffalo. We felt it was a great choice too. We also sent him Shea's Performing Arts Center and the Statler. This session was also great because some of his sisters were from out of town as well. So this was the perfect time to get everyone together. Andy mentioned he wanted a Kardashian style photo session. We knew we could do this for him! Everyone was going to wear black and be pretty dressed up! We started with the whole family! We had all of our lights set up and then placed Andy and his family. We did a bunch of different poses with them as well. This was one of our favorite group shots. We also did solo portraits of everyone. And smaller groups! This family session was so much fun. It was a nice break from going to a park setting. Not that those are bad, we get amazing images. It starts to get tough to come up with new ideas when we go to the same locations all of the time. We like to give everyone something different! Location: Ellicott Square Building, 295 Main St #210, Buffalo, NY 14203 United States.